What's New?, on the website. Where Are We, and our travel plans. It was always our dream to live and travel fulltime in our RV. Beginning in August of 2000 we started living that dream as fulltime RVers. 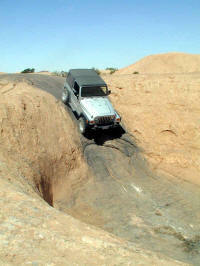 It is a lifestyle that we enjoy and we do not see ourselves "coming off the road" unless medical conditions force us to. This website is oriented towards "technical" issues related to the fulltime RV lifestyle - everything from selecting your tow vehicle, information on Heavy Duty Trucks (HDT's), electrical modifications to your RV, installation and use of solar, items to make boondocking more pleasant, communications on the road, Internet access, etc. While we do discuss in some detail selection of tow vehicles, the other sections of this web site contain information relevant to motor home or trailer users. This site does not provide general "lifestyle" information on fulltime RVing or determining if our lifestyle would suit you. 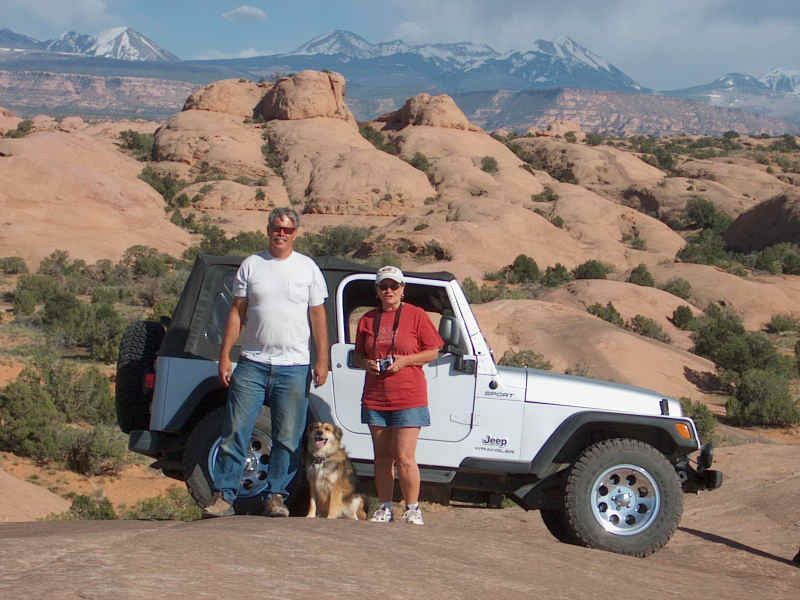 For information on lifestyle aspects of fulltime RVing we recommend our friends Howard and Linda Payne's website, RV-Dreams and their daily blog, RV Dreams Blog. Also look at Jaimie Hall-Bruzenak's excellent website at RVlifestyleexperts.com. In the Links and Files section on this site you will find references to other lifestyle-oriented RV websites. The information in this website consists of a mixture of our opinions, and facts. Where information is opinion, it is either apparent, or I try to specify that it is opinion. Factual information on electrical implementations, etc., follows best practices and code, where applicable. If you are not sure, do your own research. When planning for the fulltime lifestyle we had to consider what type of RV to use. For us, a fifth wheel trailer pulled by a truck was the best choice. If you want to read more about what we feel is one of the finest available 5th wheels check out the New Horizons portion of this website. We started out with a 16,500 lb Newmar 5th wheel, pulled with an F550. We thought we chose the ultimate tow vehicle when we purchased our Ford F550. We were wrong! After several years on the road (towing with our F550) we realized that if we ever wanted a heavier 5'th wheel, we were going to have to upgrade the truck first. So we started researching Medium Duty Trucks (MDT's). The typical MDT you see is a small Freightliner or International converted for RV use. These are capable trucks, with many of the features of pickups that most people are familiar with. You should carefully consider their advantages when looking for a more capable tow vehicle. In the process of searching for our "ultimate" RV Hauler, we realized that for us a class 8 tractor would make a better hauler than an MDT. 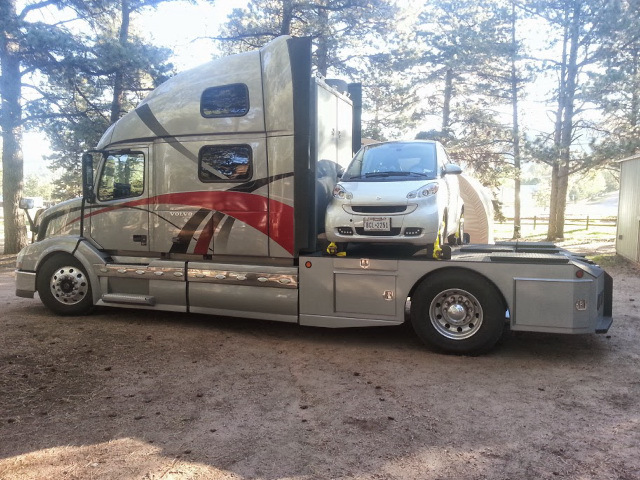 What you see here is a result of our search - what we consider the Ultimate RV Hauler. An MDT can be a better choice for some people - take a look in the MDT or HDT? section for our view on the tradeoffs between them. In more recent years the pickup class has greatly expanded their towing capacities. With the advent of what I call the "super pickups" - like the Ford F450/F550, and the newer Dodge 3500/5500 - you can pull most of the larger 5th wheels. These are worth considering if you are pulling a 5er in the sub-23,000 lb range. Over that and you will be far better served with an MDT or an HDT. Above, Our 2009 Volvo 780 with our smart car loaded for travel. Since June, 2003 we have been towing with a Heavy Duty Truck (HDT), otherwise known as a semi-truck or a class 7/8 tractor. 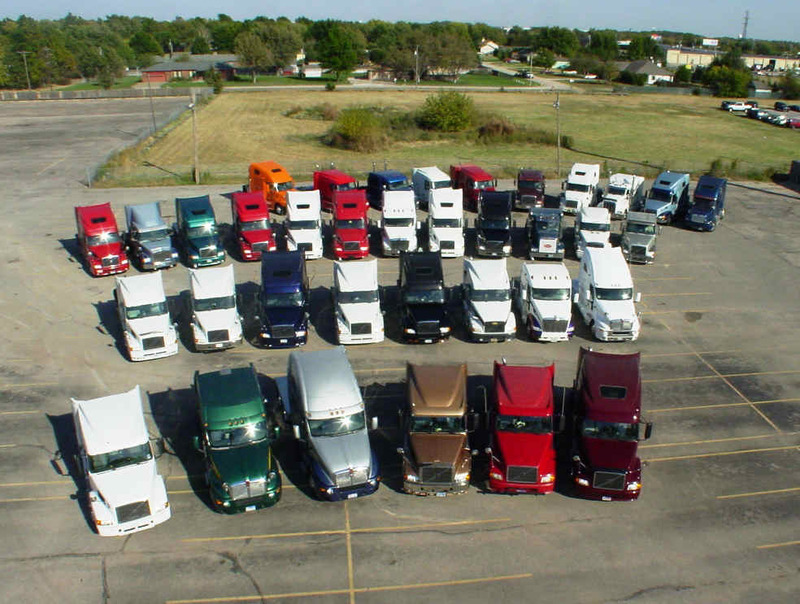 Yes, these are the trucks you see towing freight all over the country. An HDT is truly the ultimate tow vehicle. 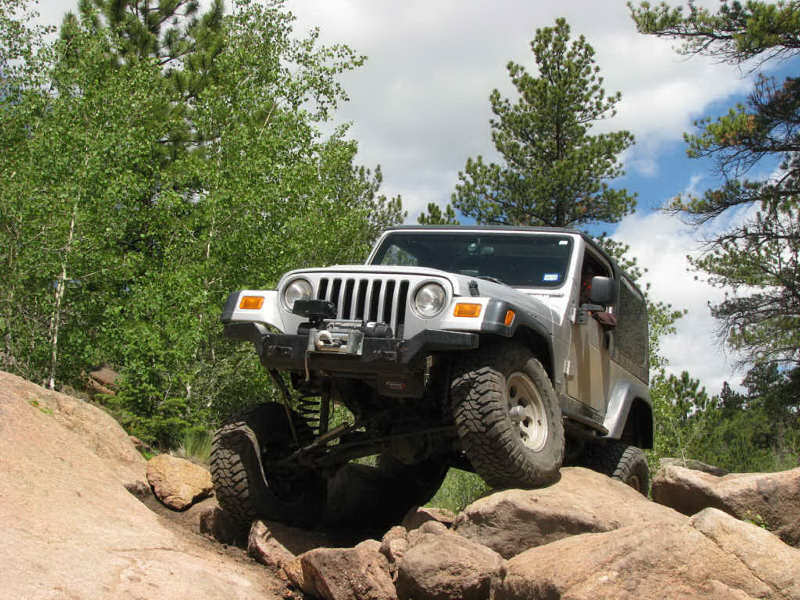 It can tow any RV trailer on the market, stops easily with weight behind it, and is more capable in every regard than the typical RV tow vehicle. In addition, it is easier to drive than a crew cab dually pickup, is far more comfortable, and you never need be concerned with overloading it. However, an HDT is not for everyone! 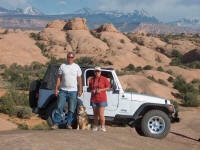 For almost three years our Volvo 610 tractor (shown above, boondocking at Moab) was our only vehicle. We are often asked how we managed daily driving in such a large vehicle. The reality is that our original Volvo tractor was not much bigger than a crew cab dually pickup (it was slightly longer, and the same width). For many years we had a Jeep for off-road use, which we towed behind our 5th wheel. You can read about towing doubles (also called triple towing) in the Legal Issues section. In 2012 we purchased a smart car in addition to the Jeep - the smart rides piggyback on our second HDT - a Volvo 780 which we built in 2013. We sold our Jeep in the winter of 2013, which solved the double towing "issue" for us. Our Volvo tractor is titled as a motorhome in Texas. Our original truck, shown above with our 2010 New Horizons, was a 1999 Volvo 610 with a 182" wheelbase. It is pushed by a Cummins ISM with 400 hp./1450 lb/ft of torque. This is the smallest engine commonly found in an HDT! 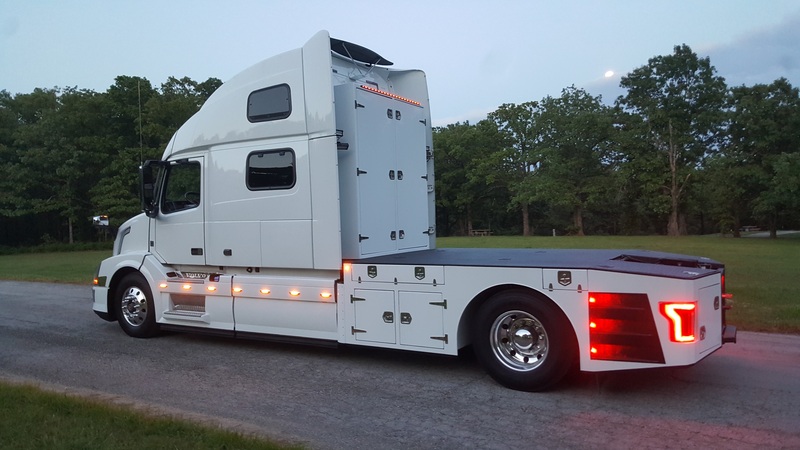 This tractor is considered a "mid-height" sleeper - it has 6' 7" of interior headroom, and is 10' 10" on the exterior. The exterior height is slightly below the trailer height, is more practical for bob-tailing around town than a full-height tractor (which is 13'+), and has the added advantage of keeping the nose of the trailer bug-free! 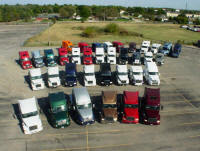 To see more about our truck look at Selecting Your HDT and Our Truck Body. In 2012 we purchased our second HDT RV Hauler - a 2009 Volvo 780 tractor with an I-Shift transmission, Volvo D-16 engine with 515hp and 1850 lb/ft of torque. We upgraded to this truck for the additional sleeper space, the advanced transmission, additional power, and the ability to piggyback a smartcar on the bed. While we could have rebuilt the 610 to piggyback a smart car, we made the judgment that it was not worth the investment in the 610 and we would be better served starting with a "fresh" build. In 2016 we again upgraded the truck - this time to a 2015 Volvo 780 with a D13 engine set at 455 hp and 1750 lb/ft of torque. We again built a hauler body on it so we could carry a smart car. This second generation hauler body incorporates many changes previously not seen in HDT bodies. The new truck is shown below. Some portions of this web site document the conversion process of taking an over-the-road tractor and turning it into a dedicated RV hauler. We added a number of items to make our trucks more comfortable, allow us to take overnight trips with just the truck, and to title the trucks as an RV (instead of as a truck). Specific projects we did on our Volvo's are shown in some detail. We hope this helps you with your conversion project! While the truck conversion sections may not interest those choosing to RV with a motor home, the rest of the website contains information relevant to all RVs. Information on selecting an HDT and converting it yourself is in the Selecting Your HDT section. Use of Heavy Duty Trucks for hauling RVs has increased quite a bit in recent years. There is a National Rally for heavy duty haulers held in Hutchinson, KS in early October every year (click the graphic for info). If you are thinking of using an HDT for hauling an RV, you should seriously consider attending this rally. It will provide a wealth of knowledge, the ability to see many trucks in one location, talk to the owners, and drive some of the rigs. There is no better way to understand the value of the HDT for RV hauling, or to learn as much in such a concentrated timeframe. All are welcome, and prospective owners are especially encouraged to attend. There are nearby hotels if you do not have an RV. Check out the HDT Rally for current information. A time lapse video of the 2013 HDT Rally truck "lineup" is available here. Probably the best resource on the web for info on HDT's is the HDT section of the Escapees RV Club forum: Escapees Forum. In addition to that, there is a great deal of information in the Heavy Hauler RV Resource Guide, which is a collection of information related to using HDTs for pulling recreational vehicles. If you are looking for an HDT, or just about any product or service related to an HDT please consider using RVH Lifestyles. RVH Lifestyles specializes in HDT conversions, sourcing of trucks both new and used, mechanical repair and accessorizing. Just about anything to do with using an HDT in RV service is available from RVH Lifestyles. The business is centrally located in southeast Kansas, where all manufacturing is perfomed. Pictures of a "typical" conversion performed by RVH Lifestyles can be found HERE. Full disclosure: I am a partner in this business.